Why Use Blogs in Education? Plugins are programming scripts that add additional functionality to your blog. These are often features which either enhance already available features or add them to your blog. You can access the manage plugins screen in the dashboard from the navigation menu on the left. Individual plugins can be activated or deactivated with the Activate and Deactivate links at appear under the plugin name in the list. Yuo can activate or deactivate more than one plugin at a time by checking the boxes beside their name [1 & 2]. You then choose the Action from the popup at the top of the list  (or the one at the bottom) and click Apply . This plugin has been removed for the users plugins. It has been activated site wide. The plugin insures that huge images are resized to a more sensible size for storage. The size can be adjusted by blog Admins. The settings are in Settings -> Media. Lightbox plugin will open linked images in a lightbox. For Galleries the Jetpack carousel module is probably a better choice for this (April 2015). 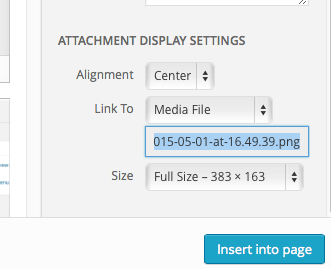 If you use the lightbox plugin make sure that the images link to media files. This plugin’s functionality is largely replaced by WordPress 4 core functionality. A ‘minimised’ version of the plugin is present with no functionality. It is strongly recommended that you use the built in WordPress media players and deactivate Anarchy. This is a new plugin, it is use along with the now default them TwentyFourteen. Once activated it adds settings into the Appearance-> Customise -> Colors section. After activation this plugin you can import content from a standard WordPress export. The import facility is found in the Tools section of the Dashboard. Top 10 Reasons for Students to Blog | Flickr - Photo Sharing! Student Blogging Challenge | Challenge yourself to connect and learn through blogging.